Well I have to say that these full album nights have really taken off. Having had two really successful evenings with 30-40 ukers listening to, and bashing their way through, Parallel Lines and Rubber Soul, we’re now planning a to make this a semi-regular event. Undoubtedly you’ll be seeing some of those popping up on here over time, but the next one is going to be Oasis’ sophomore classic, (What’s The Story) Morning Glory. I must say up-front that this songbook is definitely (maybe!) not all my own work. Most of the credit for this must go to my good ukeing friend at Southampton Ukulele Jam, Ian Rothwell, who has put in a massive amount of effort to pull this together. We road-tested it earlier this week, and we’re relatively happy with how it sounds, so here it is. Released in October 1995, (What’s The Story) Morning Glory was the album that propelled from a very successful indie rock band at the vanguard of the Britpop scene (that album was the fastest-selling debut album of all time in the UK when it was released) to a world-wide phenomenon. World-wide the album has sold an estimated 22 million copies, it was number one in the UK for ten weeks on it’s release, and it spawned a swathe of classic singles, with two (Some Might Say and Don’t Look Back In Anger) reaching the coveted number one slot, and another two (Wonderwall and Roll With It) peaking at number two. The last of those, Roll With It, was the subject of the much-hyped Britpop battle with Blur, when they both famously released new singles on the same day, Blur releasing Country House. Blur won that particular battle and hit the top spot, but I think it fair to say that, at least if judged commercially, Oasis won the war. Marking a move away from the rawer sound of the band’s debut, (What’s The Story) was marked out by slower tempos, songs more ballad like (although still swathed in loud rock-and-roll guitars) with huge sing-along choruses, and with richer instrumentation than on their first record. The critical reception the album received on its release was a little lukewarm, many comparing it less favourably to its predecessor, complaining that the album was derivative and simplistic, as well as being seen as prompting a major step-change in the loudness wars. As ever though, timing can be everything with these things, and the emergence and mainstream embracing of the cultural phenomenon that was Britpop at the same time as this albums release allowed Oasis to surf its wave with massive success. And so here it is – the songbook. As I said earlier, the hugest of thanks to Ian Rothwell for doing most of the work on this one. As you’ll see the format is slightly different to previous songbooks, but the content is all there. Only one of the songs (She’s Electric) is not in the same key as the original (that has been upped from F# to G for obvious reasons! ), so all the rest are definitely play-along-able. As far as possible we’ve tried to keep the arrangements faithful to the originals. We haven’t tabbed any solos or the like – in actual fact there aren’t that many – but feel free to work those out yourselves. Sing loud, with great enthusiasm. And most of all, enjoy! P.S. 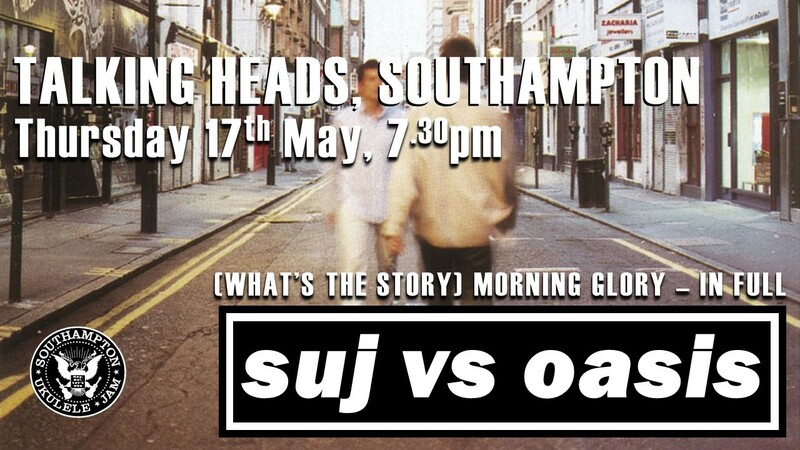 If you’re interested, and in the Southampton area on the 17th May, this (see below) is the event where we’re going to be playing this one through. Categories: Indie, Rock, ukulele | Tags: 1990s, 1995, Britpop, Indie, Oasis, Rock, ukulele | Permalink. If I’m out in the car by myself for a drive, I like to dig out a CD and crank the volume up. A couple of days ago I had that opportunity, and was in the mood for a bit of noise and attitude. Having a quick scan through my CDs I noticed a copy of Oasis’ debut album Definitely Maybe, and thought that would certainly fit the bill. So as I pulled away the open bars of this opening track filled the car with a wall of noise, and we were off. Definitely Maybe was, alongside Blur’s Parklife, the defining starting gun for Britpop. Although arguably a somewhat backward-looking phenomena, being heavily influenced by british guitar pop of the 60s and 70s, for a while it was a breath of fresh air that usurped the early 90s grunge sound, although – as these things always do – it eventually petered out amongst repetition, diminishing returns, and cheap third-rate imitations of itself. 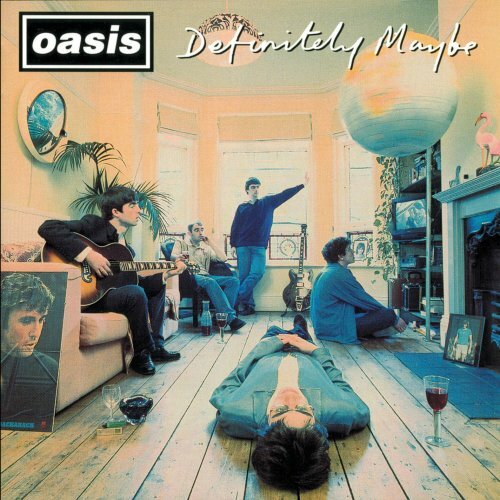 However, Definitely Maybe can rightly be held up as a classic, and certainly blows the cobwebs away. A blend of the attitude and noise of punk bands with the melodic intents of 60s guitar bands, the album drives forward on an enormous wall of guitar sound, great dumb songs (don’t go looking for too much meaning in here) mostly from the pen of Noel Gallagher, and the rock and roll attitude of vocalist brother Liam. Rock ‘n’ Roll Star sets the tone from the off, and the album retains a remarkable consistency all the through to closing acoustic number “Married with Children”, taking in classics such as “Live Forever” and “Cigarettes and Alcohol” along the way. Clearly a ukulele version is never going to achieve the sound of the original. But the basic song underneath all of that is a good one, and so I believe it works well (see here for an example of how it might). It’s relatively straightforward – essentially one verse and chorus, repeated! I’ve raised the key by half-a-tone to make it easire to play, and I think that works OK. Play with attitude, and enjoy! Categories: Rock | Tags: 1990s, 1994, Oasis, Rock, ukulele | Permalink.